These models are streamed. In order to view these models, you must have an internet connection. For demo purposes, the data will be streamed from Lattice Technology servers. For your own implementation, the models would be published with iXVL Publisher to your own server. From your iOS device, open this link: http://www.lattice3d.com/wi-samples. iXVL Player QuickStart - We suggest opening this window on your desktop/laptop while you are navigating the model with your mobile device. The following demo files below should already be resident on your mobile device--they should have been downloaded with the install from Apple Inc.'s® App Store™. After starting iXVL Player, you will be presented with the following screen, which lists the demo files available which have already been downloaded to your device. 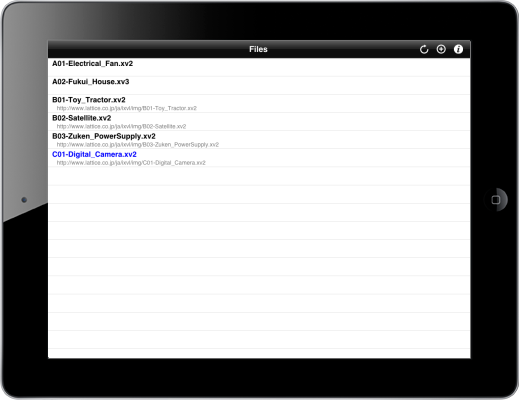 Select any of the files listed for viewing on your mobile device. 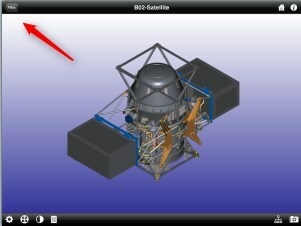 NOTE: If you want to try a rather large model, use the Satellite demo file. 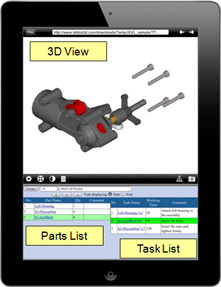 It contains over 3,000 parts, and its original file size in SolidWorks® CAD was 3.5GB. The resulting XVL file size is 3.5MB. After you have viewed one demo, you may return to select another by touching here.